The rostrum is dimpled and bumpy. Each bump has a hair sticking out of it called a vibrissa. These vibrissae are also found around the mouth. They function as tactile sensors, giving the whale a well-developed sense of touch. On the side of the head, seven feet from the tip of the rostrum, are the eyes. The white part of the eye is very thick and pliable. It can handle high pressures from diving without deforming. Muscles around the eye bend it so it can focus on objects above and below the water. The eyes are also suited to see in low-light conditions. Baleen whales don’t have teeth, instead they have 130 to 180 baleen plates that hang down each side of their upper jaws, like a fringy curtain. The plates are made out of fingernail-like material called keratin. It makes the baleen strong, but still flexible. 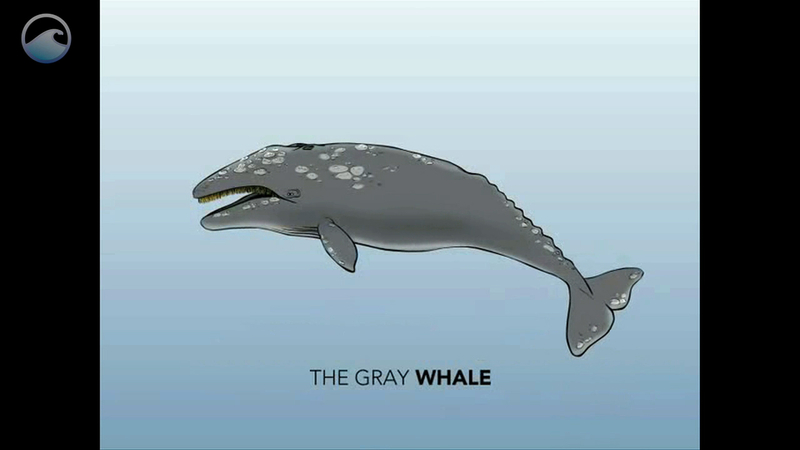 On the throat, the Gray whale has two to seven grooves of excess skin. These grooves expand and contract, allowing the whale to scoop up giant mouthfuls of food and water when it’s feeding. During feeding, the whale’s mouth is open a lot so it won’t get hypothermia in the cold waters. Arteries and veins in the tongue act as heat exchangers to help conserve body heat. The blubber on a Gray whale can get up to 10 inches thick. Blubber is a combination of fibrous and fatty connective tissues, and large oil-filled cells. The blubber layer isn’t just for insulation in cold waters; it also stores energy when the whale isn’t eating, and it helps keep the whale buoyant. Unlike us humans, Gray whales have a flexible rib cage. When diving to deep depths, it easily bends under pressure without breaking. The tail is made up of two large flukes with a notch in between them. The flukes are controlled by a massive muscle system in the peduncle. These muscles account for a third of the whale’s total body weight. The pectoral flippers are paddle shaped and pointed on the ends. They’re used for steering and, along with the flukes, for stopping. You won’t find a dorsal fin on a Gray whale. Instead they have a dorsal hump, followed by 6 to 14 nodules, or, knuckles. These bumps run all along the dorsal ridge to the flukes. All these parts working together make the Gray whale one phenomenal marine mammal.